Weekend ritual to Mustang Maniac was upon me before I knew it this week. I arrived to see the Adam shunting lorries around the yard trying to make space fora few more cars that had arrived. We walked to “my” workshop (I wished) and discussed the plan of action. We made a list and got some parts from the bursting at the seams stores. We wanted to get the rear quarter panel trims in place. The common mistake here is to just screw them on without the water shield kit. 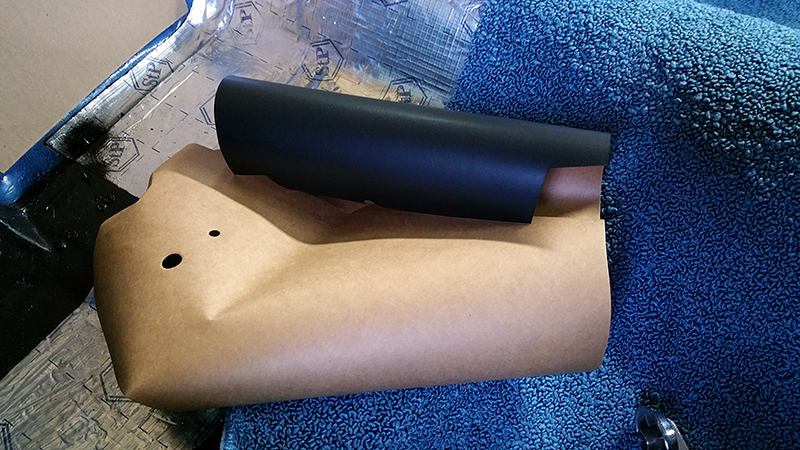 The water shields are a special paper with a coating to keep the moisture out. This kit will be for the rear quarter panels and the doors behind the cards when they are fitted. The cars need to have some adhesive and this is like a mastic that is stuck to the paper with the wax side facing to the outside of the car. Attaching the paper is quite simple as long as you line it up with the rear wheel arches. 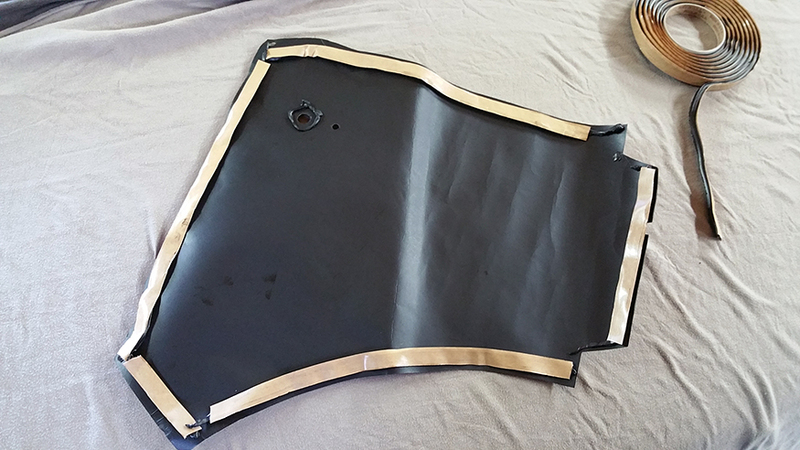 Peel the protective backing of and press to the framework. The die cuts will line up with the window winder and the screw cut outs too. The main metal quarter trims themselves have a “fuzzy” which staples to the metal. The staples holes are already there on the panel and the corresponding holes in the replacement fuzzy kit. The staples will be pressed through the panel and bent over at the back out of sight. This will make sure the staples within the fuzzy itself will not scratch the chrome surface or the glass when the windows are wound up and down. Drop the panels over the frame and align the screws holes up. Do not tighten the bottom ones up yet as the carpet needs to be clamped into position first under the panel. Pulling the carpet taught at the bottom and aligned with the sill top, then you can tighten all the screws up. Now the heading asked the question What’s missing? From the pictures see if you can guess (apart from the handle missing on one side, that don’t count). Yep – the seats. These are at the trimmers now having the seat covers fitted professionaly. Hopefully these won’t be to long and we can get them fitted into place. Saying that the seats are not in place can be a problem for the progress of the car. But, not having them there has helped a lot as we can sort the interior out without fear of damaging the seats, or having to store them off the car while you work on it inside. The extra space provided by the void where the seats should be comes in very handy for the next task. The sill scuff plates were next up on the agenda. 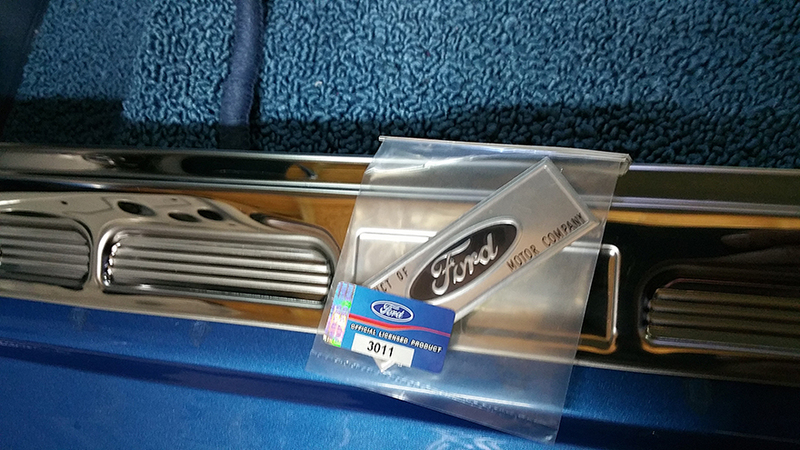 These come in many styles from cheaper budget ones, or as Adam now calls them “Enos” range, or these full on Ford tooling beauties which are highly polished stainless steel. Stainless stell is used in razor blades and I found out why. The unfinished sides managed to cut both thumbs on the knuckle. I was more worried about the blood on the new carpet than the little chunks of skin shaved off. A bit of rag and a few swear words later I was back on the case to finish fitting them. The sills have four crews at the top and five on the back. The scuff plates will cover the carpet and wire channels to finish of the look of the door area. The plates were dry fitted to work out where the weather lace will need to go from the interior quarter panels to the sill plate. Screw in the lightly untill everything is in place and then tighten up. Starting on the top and working to the back inside the car. The holes lined up well due to the Ford tooling and no need to get the drill out and make endless holes. Remove the protective cover from the scuff plates to expose the polished surface. The final piece of the sill is the badge, there some various options over the course of time so I went with the correct badges for the year. Once it’s all complete it will look like this. 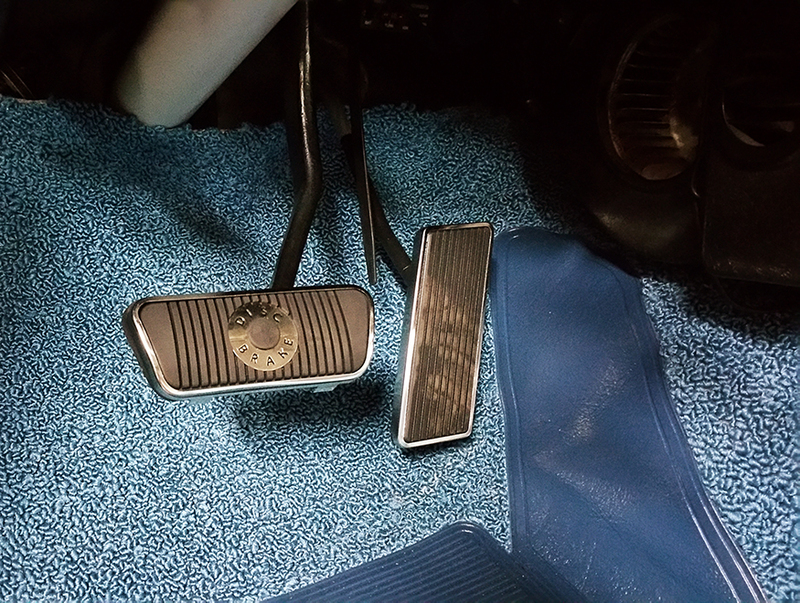 We had another bling part to put on the brake pedal while we were at it, the polished stainless surround. This turned out to be a pain and took just as much time to fit as the scuff plates did. 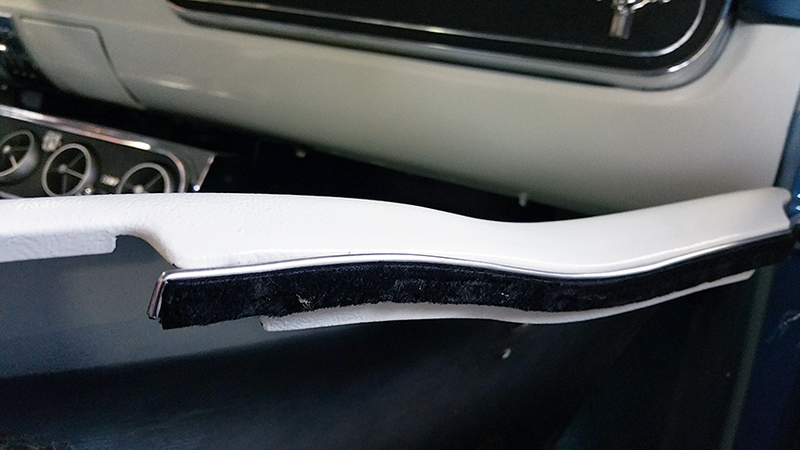 The rubber being new was still swollen and the trim needed to be massaged into place. Adam had the leather hammer to help speed things up a bit as it were! 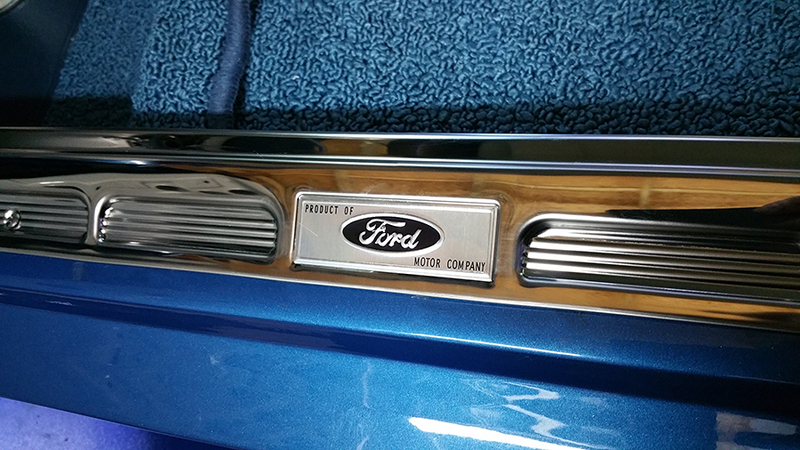 This entry was posted in General and tagged carpet, ford, Mustang, Mustang Mania, one man, seats, stainless steel, trim, weather shield kit. Bookmark the permalink. 7 Responses to What’s Missing? Like that detail from the bygone era “disc brake”. The technology had just arrived. Thanks Sami, you’re right and the top specs had them as standard such as the Shelby cars. Now days it’s a no brainer as so many idiots on the road you have to be able to stop. Hi Dana, I have started her on the odd occasion yes, but the carb needs balancing as there are a couple of issues at the moment on idle. Most of the time I am busy trying to get things in place. I have a connected battery charger which I will be posting soon to keep the battery topped up. The carpets are fairly soft yes, but not to deep a pile. Not many jobs left now on the car. Geo setup and road tests to come. Loved your final comments. No there is not better high. Not everyone gets it, and that’s okay. We know who we are! PS Love, love, love the bling! Thanks Debbie, with the new parts I am almost getting that “new car smell” in an old car, very strange. It won’t be long before it back to old metal n petrol again. We certainly do know who we are, we should start our own secret hand shake. Lol. Old Mustangs are one of the better things to get high on, but not a cheap high! I saw and photographed three 1966 Mustangs at the Corrales Harvest Festival this weekend. One is modified into a street rod and is being given away as part of a fund raiser. One was restored to original, and the other is original, it’s for sale, and looks ready to become a restoration project. Email me at elcheo@swcp.com and I’ll send you photos of the Mustangs.